Gnocchi AKA little pillows of joy are the star of this dish! Combine this with seasonal vegetables, a dash of creme fraiche and a liberal helping of hunger and you have the perfect dinner. If you can’t find speck, then a good parma or serrano ham can be used. 1. Boil a kettle of water and cook the kale in a large pan for 3 minutes- refresh in cold water, drain and set aside. 2. Start off with melting half of the butter in a large non- stick frying pan over a medium heat. Pop in the strips of speck and fry until starting to crisp up. Remove from the pan and set aside on a piece of kitchen paper. 3. Next you need to fry the mushrooms until the water evaporates (you don’t want a watery sauce!) and the mushrooms turn golden. Again, remove from the pan and set aside. 4. Add the remaining butter and cook the shallot and onion until softened. Pour in the wine and cook until it has reduced by half. Stir in the creme fraiche, season to taste, and simmer for a couple of minutes whilst you cook the gnocchi. Gnocci only takes 2 minutes so drain when the gnocchi rises to the surface in a boiling pan of water. 5. 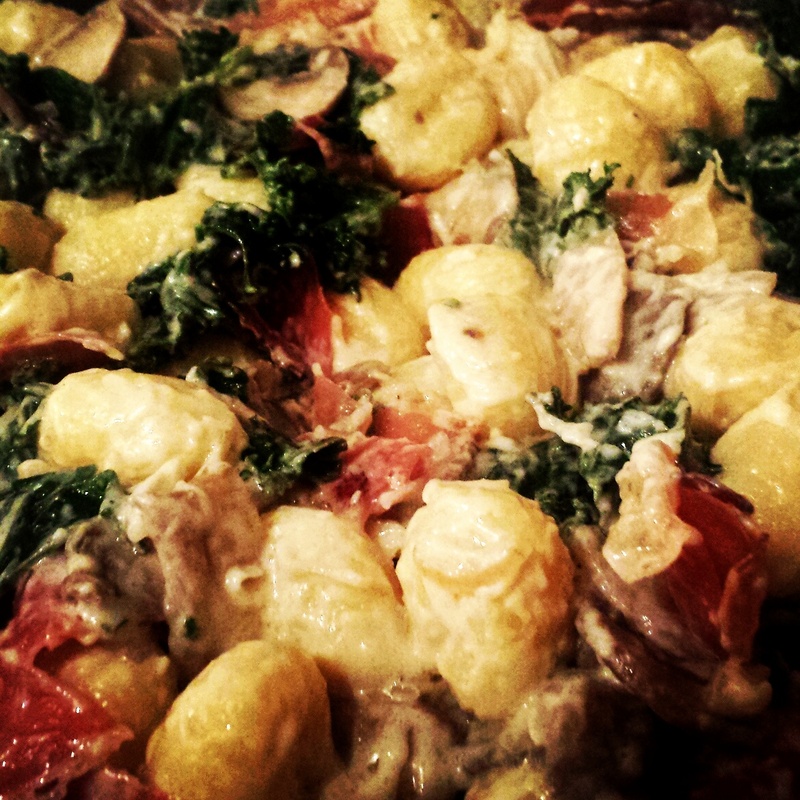 Stir the mushroom, kale and speck through the sauce before also adding the cooked gnocchi. Cook for a further minute to make sure it is all heated through and serve in warmed bowls. A sprinkling of parmesan is also called for! A warming autumn gnocchi which is a sure fire pleaser!